given to us by Tammy of Art and Inspirations. The word I chose was "Wish". get it over to Inspiration Avenue. I love the hand-sewing...what a great tag for a present...later to be used as a bookmarker. There is SO much to see in this tag. I wish I could see it in person! Your hand sewing around the edges, so painstaking and precise, really sets this tag off. Really a lovely addition to the challenge. How sweet. May all of her wishes come true. The word "Wish" is one of those great words that sounds like it should...a wish is a whisper of hope! Your presentation of the word Wish is really beautiful. I'm enjoying the variety of ways people meet the IA challenges. I LOVE this- what a perfect interpretation of "WISH". It's ethereal and beautiful and bittersweet all at the same time- beautiful! I'm sorry I didn't get by before, I've been so busy, I'm just now finishing Sunday's blog travels. 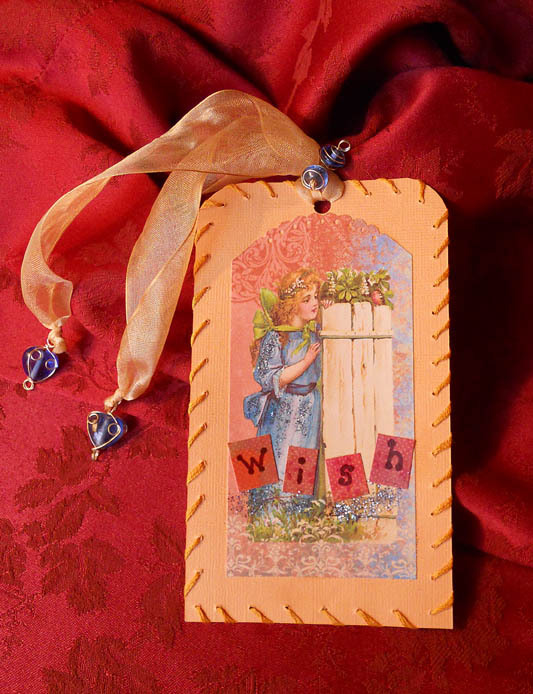 Aww, I love your "Wish" tag--there's so much detail and the beads are amazing!!! "wish" is definitely my favorite word this year! Love your tag creation Maggie and that giveaway piece you have for this month is exceptional! !